So we had a big Garage Sale this weekend and from the profits, I decided to buy a new Lawn Mower, after heavy research and reviews I decided to buy a Honda..
And I love it, set up was about 10 minutes, first cord pull started. I bought this one for 399,- at my local home depot. So far the only negative aspect might be for taller people that you can’t adjust the push bar handles, the height is not adjustable, however you can adjust the variable speed handle in the middle and get it to a higher position. Time to Workout: Plain and Simple designed Ultra Timer to aid segmented exercises such as interval training and circuit training. But you can use it for any sort of timing function. 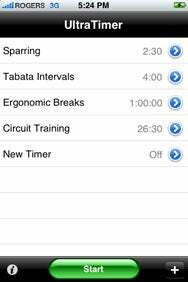 UltraTimer by Plain and Simple Software is an ideal tool if you want to use your iPhone or iPod touch to keep you on track. Personally I like the customization options of UltraTimer better then the tabata timer as it can fade the music when you work out and the sounds at the different time intervals. Well its a while ago but i decided to start blogging again. We really are enjoying our Erie neighborhood and the more the weather starts to become nicer the more we are doing outdoor activities. One of the activities I started up in January is fitness mostly running and weights and trying to loose some calories. It’s going well, lost almost 35 pounds (15kg) so far. With the nicer weather I was in need of something to hold my Ipod touch, because I can’t run very long without music so I came across this case you can wrap around your arm. Its from Griffin technology they always have really good stuff for the ipod and not too expensive. Also some new earbuds, tunebuds from their website as it was 2 for 1. Sent from my iPod using new print screen function and mail application. So yes you can make a print screen (home button 3 sec and then shut down at top) of any screen when using your iphone or ipod touch. After upgrading to the new firmware late Friday night and installing my free apps and 2 game apps I bought I have been playing around this weekend and I love it, this is really worth finally the money of the touch. I love my Pandora music app listing to Pandora stations I created under my account, it works perfectly in my dockingstation as well. I bought 2 game apps, Monkey Ball and cro-mag rally, this is quite some fun. With only 550 apps available in the store there is still a lot to look forward I think in the coming months. WordPress is adding a blogging tool for native Iphone use. The only negative aspect so far is that battery life is terrible when using the apps, i played 2 of the games and battery was done in 1 hour. – Flash supported app for websites like hulu, abc, nbc so you can watch tv-episodes and shows or a native flash support in safari by apple for those websites. – Wimax so I can have internet access everywhere, most of the location based apps work only when you are connected to the internet, so far this is for most users only at home as work does not have wifi installed. This is probably wish full thinking but hopefully won’t take too long anymore. Maybe in 2 year a new phone will solve that problem but I am stucked to Verizon at the moment. – Expandable flash memory slot. I am sure Apple will increase to 80GB and 160 GB models in the future when SSD is cheaper available but expansion slot would be nice like other phones and mp3, camera’s support nowadays. This is an excellent and not too expensive Ipod dockingstation. I use it for my Ipod Touch but it is also compatible with any other ipod. It is portable with a Li-on rechargable batterie which makes it nice to take outside on our deck. With the extra sources of FM radio and Aux to connect another cd player or stereo system, remote control, both Ipod charging from base as well as mini USB sync port. It is a very complete system. It has been busy lately so a long time ago since I posted for the last time. But I recently became owner of a Playstation 3, my first gaming console ever. After playing X-box 360 and its predecessor and seeing the WII, I have to say the PS3 is definitely my favorite. Especially the fact it has blue ray dvd with HDMI output to my Panny LCD tv. The first game was Grand Autotheft and I rented some movies, Cars for my son as that is his favorite movie. The quality is just outstanding. The only thing negative is that the PS3 does not have a lot of Kid rated games so far so my son (3 years old) can’t really play yet. I found Cars the movie game so probably going to buy that for him. Finally I decided last Friday to purchase an Ipod. This has been already for a couple years on my wish list. Initially I was debating of getting the classic Ipod video 30 or 80 gb but after my brothers in law showed off their Iphone respective Ipod touch, I decided to go for an Ipod touch as well. The 16GB should be sufficient enough to hold most of my music, video and photo content as I am pretty selective in adding this to my player. As we also are missing some music system in our house, we sold all our equipment when we left Amsterdam 2 years ago and did not purchase yet a new stereo or Home Theatre system, I also investigated some Docking stations. I came across the Griffin Evolve as this has wireless speakers you can place in any room. A bit expensive 299,- list price but on Ebay I bought a system for 1/3 off the price. It is all in shipping status at this moment, so can’t wait till it arrives coming week. The evolve has 2 boxes you can place 150 feet away (45.7m) from the base, it also can connect to your TV, stereo and home theatre system. On my wish list to buy very soon is the Tivo HD DVR. Today I heard the following news about them.